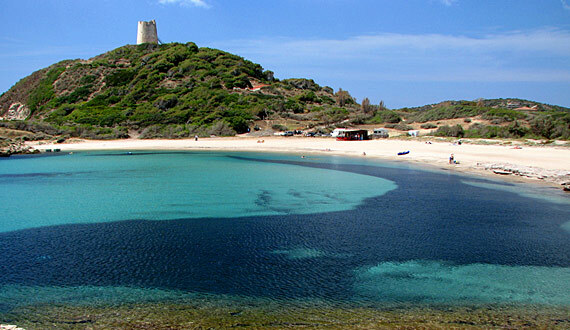 Chia Beaches in Sardinia. Chia is a small rural centre which has a bay considered to be the pearl of the Southern coast. In the hinterland, one of the most lovely and varied of Sardinia, between mountains and granite rocks is the Natural Reserve of Is Cannoneris, one of the vastest on the island. But its true colours are that of the seven beaches which wind along the blue, turquoise sea along the coastal track from Chia to Capo Spartivento. About 2 kms south east of Chia, very nice and tranquil is the beach of Su Cardolinu accessible with a path which winds between dunes and junipers or with a walk along the rocks which enclose the beach. The beach of Porticciolo, and Colonia, a candid sandy stretch almost a kilometre long towards Monte Cogoni. The beach of Su Giudeu, after Port Campana beach, is one of the nicest in the Mediterranean; very long with fine sand, washed by transparent waters and surrounded by dunes almost 20 metres high topped with junipers, which makes it a magical place. About 150 metres from the beach, in the clear waters, emerges the small island Su Giudeu, a dark rock which springs here and there Mediterranean marks, accessible either on foot, when the tide is out or by swimming. Nearby is the Cala Cipolla beach considered one of the most suggestive of the coastal track of Chia.